The violent tactics employed by Antifa are actually fueling the militant right and perpetuating an endless feedback loop of violence and hate. 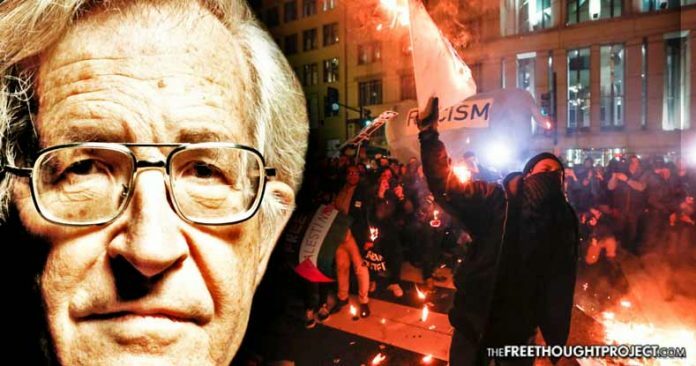 Progressive intellectual icon Noam Chomsky has publicly stated that the Antifa movement, while being embraced by the mainstream media after the recent violence in Charlottesville, will only serve to embolden militant right-wing extremists – essentially creating a feedback loop of escalating violence. “As for Antifa, it’s a minuscule fringe of the Left, just as its predecessors were. It’s a major gift to the right, including the militant right, who are exuberant,” Chomsky told the Washington Examiner. While the mass media has taken up the cause of portraying Antifa as freedom fighters who defend against “Nazis,” the reality is starkly different, as many of the activists affiliated with the movement consider themselves left-anarchists or socialists, who often wear all black and masks to conceal their identity. Chomsky is likely referring to the repeated violence seen on college campuses, where Antifa violently assaulted anyone attempting to attend events by controversial right-wing speakers, like Milo Yiannopolous, whose speech at the University of Berkley was canceled earlier this year as numerous attendees were violently beaten for simply trying to attend the event. Antifa then proceeded to cause over $100,000 dollars of damage in their subsequent rioting on the UC Berkley campus. Yiannopoulos had been invited by the Berkeley College Republicans to speak, but announced around 8pm PT on Wednesday that he had been evacuated from the campus due to massive protests. “The hard left has become so antithetical to free speech in the last few years,” he said in a video posted on Facebook. The excuse used by Antifa is that they are smashing “fascism,” while in reality, they are simply attempting to shut down public discourse, through violence, that challenges their ideological views. While the mainstream media, and some prominent members of the GOP, came out to condemn President Trump’s Tuesday statement at a press conference – where he noted that “both sides” deserved blame – the reality is that both sides are to blame for the steadily increasing violence connected to political speech. Critics believed that the president should have solely singled out white supremacists. Make no mistake that what you are witnessing is a self-sustaining feedback loop of violence. As the alt right rose to prominence as a nationalist movement, with overtones of protectionism, which many on the left label as racist (obviously there is fringe minority of racist elements within the larger alt right movement), the hard left felt a rising tide of open bigotry towards minorities and foreigners, which precipitated their attempts to shut down anyone who espouses ideas that conflict with their progressive and inclusive worldview. In response to seeing people beaten for simply trying to attend a speech, or wearing a “Make America Great Again” hat, the hard right began to gain conflict solidarity as a more cohesive movement due to the repeated and continuous assaults on Trump supporters – which interestingly the mainstream media never seemed to condemn nor publicize. Mark Lance, professor of justice and peace at Georgetown University, said he views the Antifa movement’s rise as a response to more open fascists organizing. “I’m seeing more concrete productive discussion between anti-fascists and others on the Left these days than ever before in my life,” Lance said. “There is reason to think that it will become integrated into an emerging coalition that includes Sanders supporters, democratic socialists, dreamers, the Movement for Black Lives, environmentalists, [and] Native American organizers,” he said. How can a college student that supports Trumps, and attends a speech by Milo Yiannopoloulos be given a blanket label of being a fascist? So, is anyone who voted for Trump now considered a racist, fascist or Nazi? It is important to point out that this is not an endorsement of Trump. While Americans fight amongst themselves, under Trump’s watch, the military-industrial complex is laying waste to the Middle East and the police state is continuously expanding — just as they did under Obama. While it’s one thing for “Antifa” to physically resist or defend themselves, Lance’s assertions of what has manifested seem disingenuous to the reality seen over the past 16 months, as the majority of the offensive violence was perpetrated against non-violent people whose ideological views are at simply at odds with that of the “Antifa” movement. While it may be ok to punch an actual Nazi who is threatening you, when did it become ok to punch people for simply attempting to listen, or espouse, ideas you don’t like or find repugnant? What we see transpiring is blanket label being given to anyone whose views conflict that of Antifa, thus being labeled as a Nazis, racist, or fascist – when in reality the person being assaulted may be none of those things. Ironically, this how the actual Nazi movement in Weimar Germany was able to marginalize Jews, labeling them as subhuman and vermin. Essentially, Antifa is operating with similar tactics as they attempt to dehumanize those they want to politically marginalize. Calling them racists, fascists or Nazis, is a means of legitimizing the violence they perpetuate in the name of their political ideology. No one is condemning the defensive use of force against those attempting to perpetrate violence on others, but using violence to silence those whose politics differ from yours — who are not a violent threat — is when you cross the line from being an anti-fascists to being an actual fascist.